10G Network Access Options: Which One Benefits You Most? Since the IEEE standard for 10 Gigabit Ethernet (10GbE) has been ratified several years ago, 10GbE is popular in corporate backbones, data centers and server rooms of large enterprises. As time goes by, 10GbE technology is booming. This post mainly focuses on two prevalent 10G network access connectivity options and what benefits operators can get from them. With improvements in utilization and virtualized assets, network servers now increased input and output demand. In order to meet this growing demand, there are two common connecting solutions in 10GbE networks: SFP+ direct attach cable (DAC) and 10Gbase-T SFP+ transceiver modules. DACs have been put into practice since about 2007. 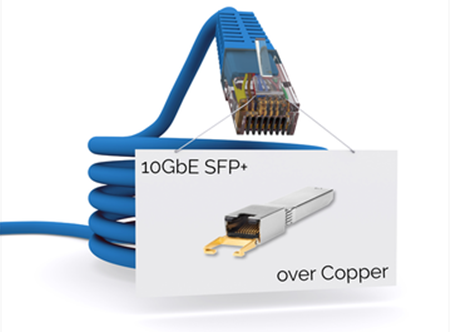 SFP+ DAC is a copper interconnect using a passive twinax cable assembly that connects directly into an SFP+ housing. By using inexpensive copper cable with SFP+ plugs integrated at both ends, SFP+ DAC offers 10 Gigabit Ethernet connectivity between devices with SFP+ interfaces. Besides, SFP+ DAC has passive and active conversions. Passive version suits connections up to 7m and active version fixes connectivity up to 15m. Due to the distance limitation, the target application of SFP+ DAC is interconnection of top-of-rack switches and storage devices in a rack. In a word, SFP+ DAC is a low cost solution for shorter distances. 10GBASE-T SFP+ transceiver module is well known as SFP+ form-factor, utilizing Cat 6a UTP (Unshielded Twisted Paired) structured cabling for network connectivity. In addition, this type of transceiver supports links up to 30m on Cat6 or Cat7 cable, which is longer than SFP+ DACs. It’s the first SFP+ transceiver that offers 10Gb/s communication over this type of media. And this SFP+ transceiver module is compatible with SFF-8432 and plugs into any standard SFP+ interface. Its standard RJ45 socket fits connections to any Cat 6a cabling. SFP+ DAC Vs. 10Gbase-T SFP+, Which Option Is Better? Deploying a smooth connection, a number of factors should be taken into account. As the price and power consumption continues to grow, choosing the most practical solution becomes important. Then, SFP+ DAC Vs. 10Gbase-T SFP+, which one is superior? First, let’s make clear what benefits the two options can offer. We have a simple comparison between SFP+ DAC and 10Gbase-T SFP+ transceiver modules. From the chart, we can see each comes with its own distinct advantages and disadvantages. With lower power consumption and lower latency, SFP+ DAC is a great choice for large high-speed computing applications where latency is an important factor. But SFP+ DACs offer less than a 10m distance. If the transmission distance increases, so does the cost. What’s more, SFP+ DACs are factory terminated and must be purchased in pre-determined lengths, which add overhead to cable management inventory. 10Gbase-T SFP+ transceiver modules have a good interoperability because of its RJ45 interface, which means this transceiver offers more design flexibility using structured cabling approach for longer distances up to 100 meters. SFP+ DAC and 10Gbase-T SFP+ transceiver modules play an important role in 10GbE network systems. When there is a need to choose between SFP+ DAC and 10Gbase-T SFP+ transceiver, carefully consider your practical needs. If power consumption and latency are critical for you, SFP+ DAC may be suitable for you. And if flexibility and long reach are more important, then 10Gbase-T SFP+ transceiver module is a better solution. This entry was posted in Fiber Optic Assemblies and tagged 10Gbase-T SFP+ transceiver, 10GbE network, SFP+ DAC on December 8, 2016 by Chloe Wang.